Jackie Robinson or Barack Obama. Who will matter more to America’s history? 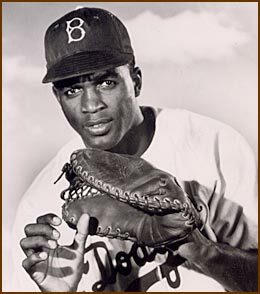 In 1945 Jackie Robinson signed with the National League Brooklyn Dodgers becoming the first black player in the major leagues. Because of his color he was “welcomed” with protests and faced great challenges on the field and off, from many of his his team mates and from many people of the country at large. But his perseverance opened the way for men like Larry Doby (First black in the American League), Chuck Cooper (First black in the NBA), George Taliaferro (First black in the NFL) and others to have an opportunity to excel in team sports. In 2009 Barack Obama was sworn in as the 44th President of the United States becoming the first black President. Because of his color he was welcomed with great celebration and has faced no great challenges in the White House or out, from anyone in the government and from few people of the country at large. President Obama had a pretty easy time of winning the presidency because his race was held up by the Democratic Party as a prime reason for him to be elected. Yet the left of America, and many of our enemies in the world at large, still say this country is horribly racist. The left claims that only more government intervention can overcome the terrible blight of racism. America has made great strides to better the opportunities for all Americans regardless of race. Government intervention has, for the most part, only slowed the growth of opportunities for blacks to excel through their own talents and make places in the world for themselves just as Jackie Robinson did.